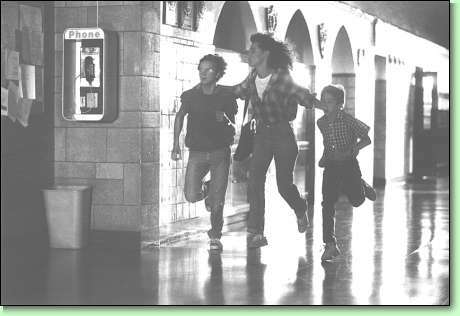 Running from the law for the past 15 years, the Pope family (l-r), Danny (RIVER PHOENIX), Annie (CHRISTINE LAHTI) and Harry (JONAS ABRY), fear they've been discovered once again and must flee in Warner Bros.' contemporary drama "Running on Empty," also starring Judd Hirsh. CHRISTINE LAHTI (Annie Pope) is best known for her role in "Swing Shift" opposite Goldie Hawn and Kurt Russell, which earned her an Academy Award nomination, a Golden Globe nomination and the New York Film Critics Award for Best Supporting Actress. Born in Detroit in 1950, Lahti majored in drama at the University of Michigan and then spent one year working toward a Master's degree in Fine Arts at Florida State University. In 1973, she moved to New York to study with famed drama coaches Uta Hagen and William Esper. After several television commercials and off-Broadway appearances, Lahti landed the role of Harvey Korman's daughter in the comedy series "The Harvey Korman Show." Her next television appearance, in "The Last Tenant" opposite Lee Strasberg, won the attention of producer/director Norman Jewison, who cast her opposite Al Pacino in the film "...And Justice For All." Following a cameo appearance in "Ladies and Gentlemen, the Fabulous Stains," Lahti appeared with Richard Dreyfuss in the film version of the hit play "Whose Life Is It, Anyway?" Alternating films with television and theatre, she appeared on Broadway in "Present Laughter," "Loose Ends" and "Division Street," among others. She also starred in "The Country Girl" at the Chelsea Playhouse, "Cat on a Hot Tin Roof" at New Haven's Long Wharf Theatre and "The Lucky Spot" at the Williamstown Theatre, to name just a few. Earlier this year she starred opposite Christopher Reeve in "Summer and Smoke" at the Ahmanson Theatre in Los Angeles. Lahti's recent television credits include the British mini-series "Wolcott," the TV movies "Single Bars, Single Women" and "Love Lives On," and the mini-series "Amerika," for which she received an Emmy nomination as Best Supporting Actress. The role of Hazel Zanussi in "Swing Shift" was followed by a starring role as a television news reporter in "Just Between Friends," with Mary Tyler Moore and Ted Danson. Lahti recently appeared in the film "Stacking," with Frederic Forrest and in Bill Forsyth's "Housekeeping." RIVER PHOENIX (Danny Pope) was born in Madras, Oregon, on August 23, 1970, the eldest of five children. Currently a resident of Florida, he has lived in such varied places as Mexico, Puerto Rico and South America. Phoenix began his professional career at five, singing on street corners with his three-year-old sister Rainbow in Caracas, Venezuela. The family eventually moved to Florida, where River and the rest of the Phoenix children (Rainbow, Liberty, Leaf and Summer) were entered in local talent contests. When a friend mailed an article about the children to Penny Marshall, then on the TV series "Laverne and Shirley," a Paramount employee wrote back suggesting the family should drop by if the were ever in California. The Phoenix family packed up and moved to Los Angeles. After numerous television commercials, Phoenix was cast in the CBS series "Seven Brides for Seven Brothers," which led to his first film appearance, co-starring in Joe Dante's "Explorers" in 1985. His following role in Rob Reiner's successful "Stand by Me" brought him public recognition and critical praise, as did his appearance in Peter Weir's "The Mosquito Coast." Phoenix was recently seen in the coming-of-age adventure "A Night in the Life of Jimmy Reardon" and the thriller "Little Nikita," opposite Sidney Poitier. His next film will be Steven Spielberg's "Indiana Jones and the Last Crusade."